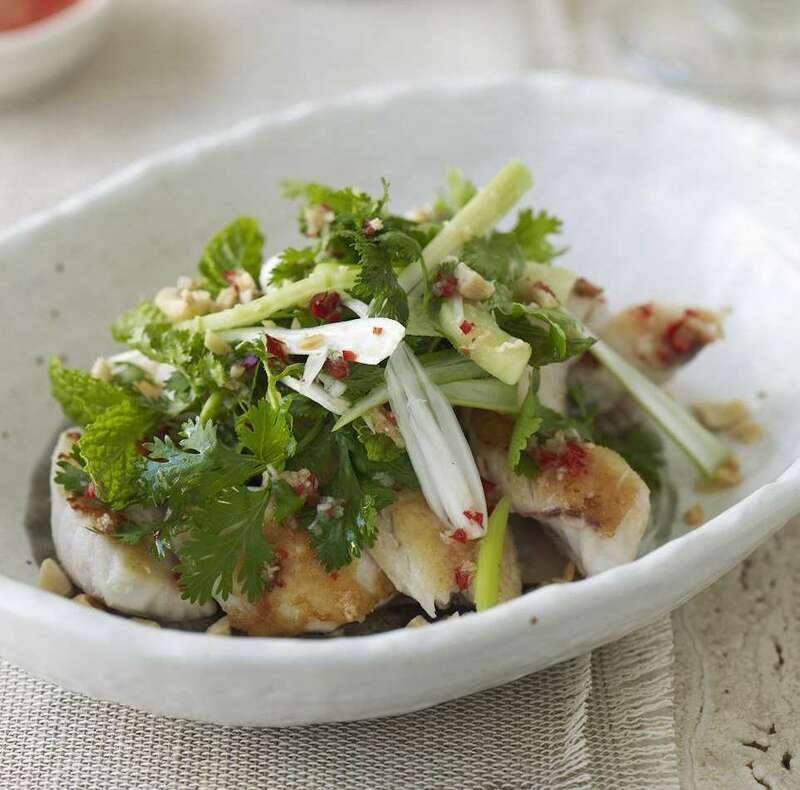 Lovely clean flavours make this dish ideal for summer eating, and it’s even better if you have caught the fish yourself! If you want to make the dish lighter, steam the fish instead of barbecuing it. 1 Peel cucumber, cut in half lengthways, scoop out seeds with a pointy teaspoon and cut flesh into half moon shapes. Trim spring onions, discarding most of the greenery and cut into long, thin strips. Put spring onions in a bowl with cucumber, mint and coriander. Cover and chill. 2 To make the dressing, whisk everything together in a small bowl. Cover and chill. 3 Rinse fish and pat dry with paper towels. Cook fish on a preheated oiled barbecue hot plate (griddle) over medium heat until golden. Flip fish over and cook the second side briefly, just to seal. Alternatively, cook fish in a little oil in a large frying pan (skillet) until lightly browned and barely cooked through, or steam it. Transfer to a platter as it is done, cool for 5 minutes, then pour off liquid. When all the fish is ready, season lightly with salt and transfer to bowls for serving. 3 Mix salad and dressing together and arrange on top of the fish in the bowls. Sprinkle peanuts on top, if using, and serve immediately. Only wish I could’ve been there to sample!! Only 10 minutes prep for this? Yep. Hello Ilaria. Nice to see you back on the 'Heke! In with the new and out with the old – time to liven up your spring kitchen with a cooking class. Get booking and get cooking!